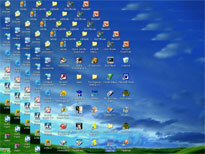 Graphic effects with your desktop. Only 24 effects. An opportunity of preliminary viewing, a choice of effects, application of effects at random or consistently, adjustment of speed of effects, a choice of a soundtrack. FREE Registration, FREE KEY !